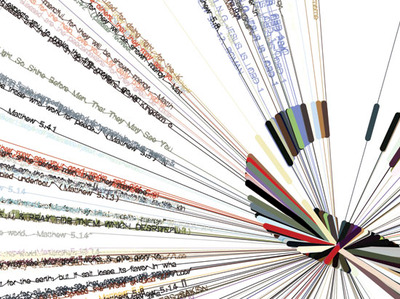 The initial letter of each chapter is computationally ‘illuminated’ by individual twitter comments, as online users post their thoughts and responses to each verse. 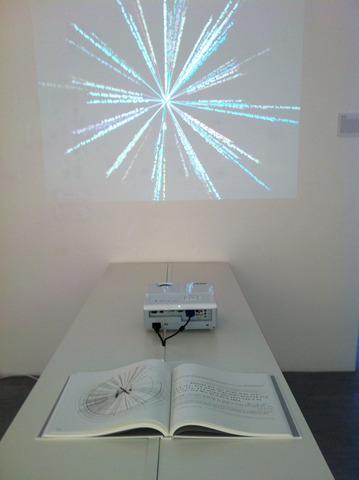 The words of each tweet are drawn as a single line, which is then used to construct the shape of the initial letter. Data details, such as the time the tweet was posted and the twitter picture of the user, generate other visual elements such as the position, angle and colour of each line. The resultant composition of each initial letter echoes the geometric carpet page design from the original manuscript, and can either be ‘read’ as single infographic or as a collection of individual, personal tweets about the chapter. 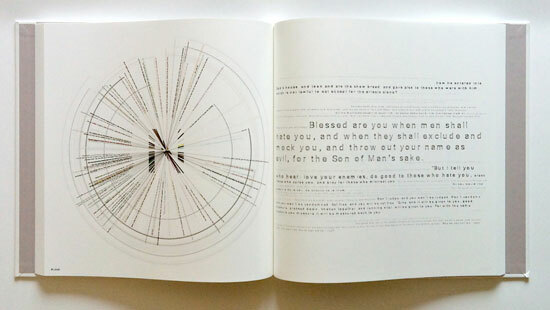 The text of each verse is computationally rendered according to the twitter data; the size and legibility of the verse text is defined by the amount of tweets each verse has received. Each page therefore graphically highlights differing levels of online engagement with each chapter and verse which, when collected together, reveal hidden patterns and visual rhythms from within the text. The finished printed volume forms a visual documentation of contemporary responses to each of the Gospels; a visual snapshot from a specific day, revealing a graphical visualisation of the online social engagement with the Gospel text.